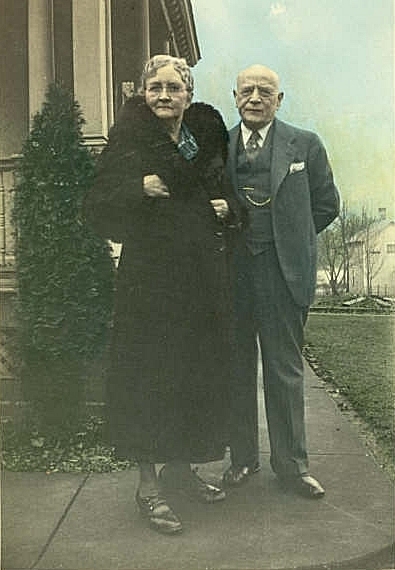 Charles Gamm and his wife [Dora?]. Outside their home in Watertown. 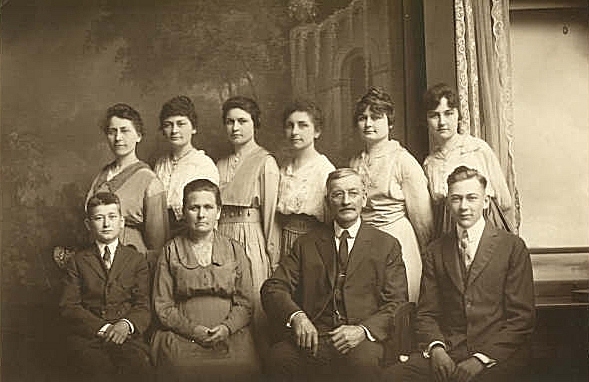 (standing) Hattie Kant, Amanda Krubsack, ?, Rosie Baganz, Laura Schumacher and Edna Gamm. 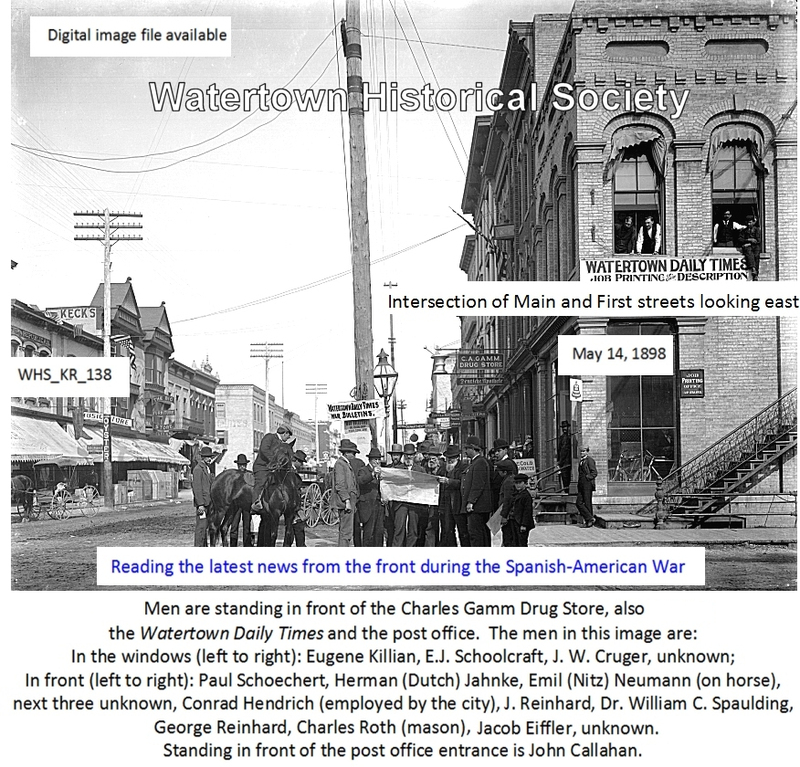 05 10 When the post office building has been remodeled, the room now occupied by the post office will be occupied in part by C. A. Gamm as a drug store, the room in the immediate rear, by Joseph Robinson as a barbershop and the Western Union Telegraph office will remain where it is at the present time. The location is one of the best in the city, being in the business center, in close proximity to Masonic Temple into which the post office is to be moved, two banks and on a prominent corner by which passes many people during each day in the year . . . The gentlemen, who are to occupy rooms in the building, were fortunate in securing the same at a moderate rental. 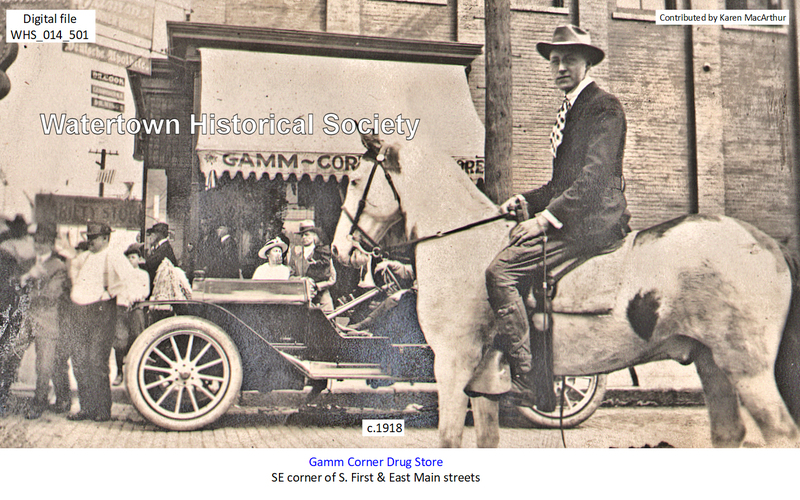 An explosion in Gamm's drug store in Main Street on Friday night at about 8 o'clock wrecked the interior of the store and placed many people in jeopardy. The explosion blew out the plate glass front and shattered nearly all the windows in the building. 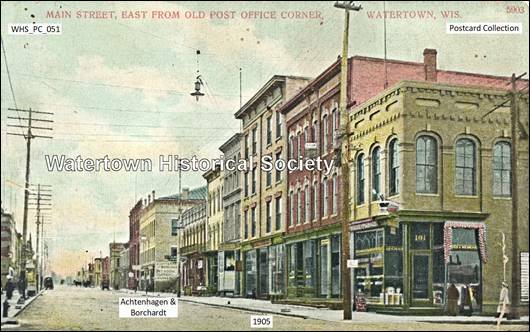 Above the store is located the Wisconsin Telephone Exchange, and the flames and smoke that followed spread so rapidly that the operators barely escaped with their lives. The floors of the building were torn up and Dell Ruedig, a clerk, who was in the basement at the time, barely escaped through a side entrance. He was pulled out by citizens. 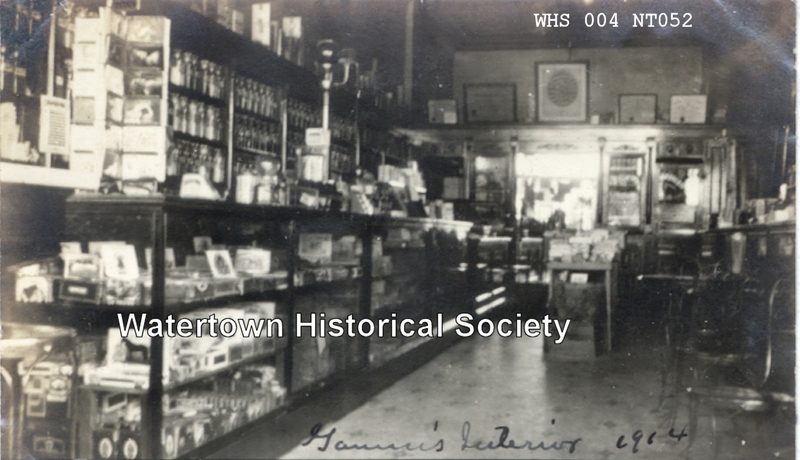 The proprietor, Charles A. Gamm, was in the rear of the store and therefore was not hurt. A few minutes before the explosion the store was filled with people. Ruedig was badly burned about his face and had two fingers broken. He was able to leave the hospital on Sunday and will be all right in a few days. Mr. Gamm was badly shocked and for a time was bordering on nervous prostration. The force of the explosion was heard all over the city and thousands of people viewed the wreck until nearly 12 o'clock that night and all day the following day. 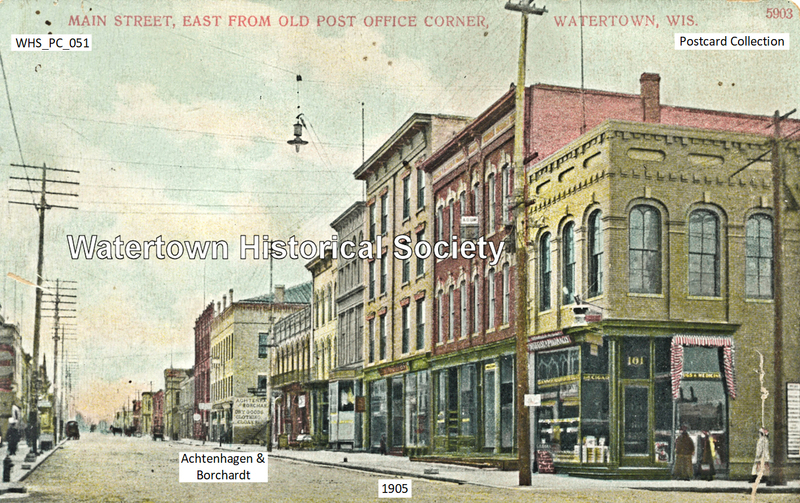 Wisconsin Telephone News: "Our Madison correspondent sends an account of the prompt and efficient action of Miss Marie Mentink, chief clerk at the Watertown Exchange, when the Exchange was damaged by fire a short time ago. 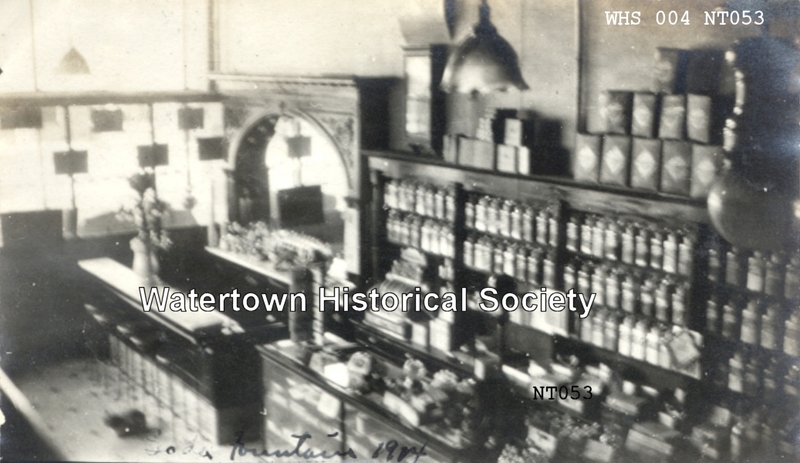 The fire occurred at night from an explosion in the [Gamm] drug store on the first floor of the building and when Miss Mentink was not on duty. 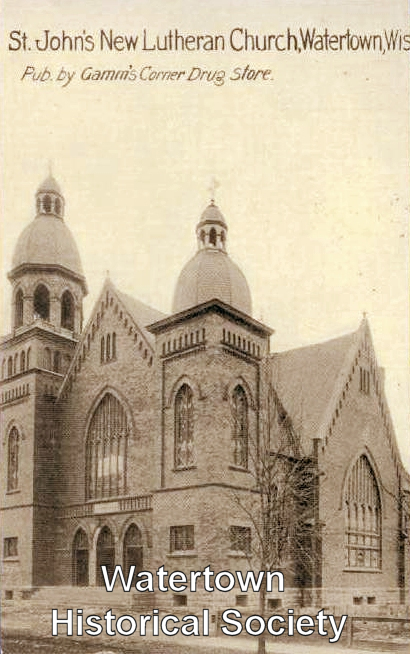 She, however, came to the building and learning that the operating force had been compelled to leave the switchboard without having time to report the fire to the district manager at Madison, she procured from one of the firemen a rubber coat and helmet and climbed the stairs to the operating room, through the fumes and smoke, where by the aid of the lantern of a fireman who accompanied her, she succeeded in getting through a call advising the district office of the fire. 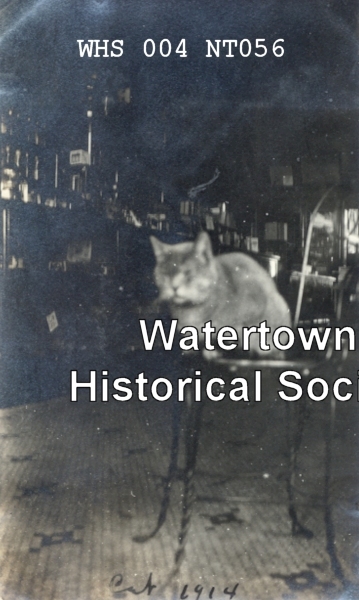 “As mentioned in an earlier issue of the News, the whole Watertown force did everything possible to protect the property and interests of the company at the time of the fire, which is thoroughly appreciated at the general office, and it is a pleasure to make special mention of the efficient efforts of Miss Mentink, who has been a trusted employee of the company for a number of years. Northwestern College Band in 1913. 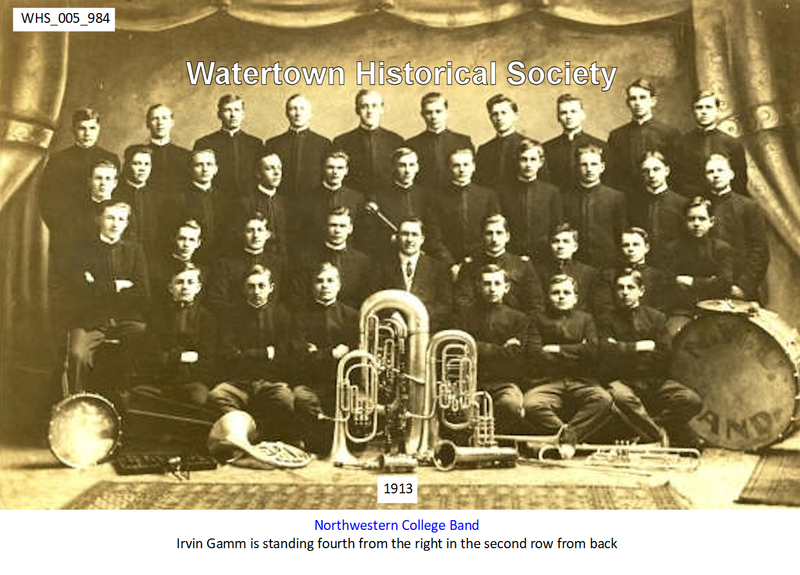 Irvin Gamm is standing fourth from the right in the second row from back. Charles A. Gamm today tendered his resignation as a member of the Police and Fire Commission. He gave as a reason that he expects to be absent from the city considerably owing to poor health. 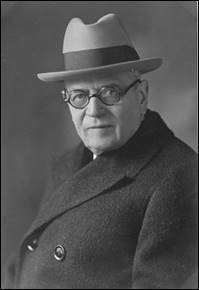 His term expires in 1922. His successor will be appointed by Mayor Mulberger and under the rule will be a republican in politics. Confirmation by the council is necessary. Mr. Gamm was appointed a member of the commission when it was first organized, by Mayor H. G. Grube, and has served continuously since. 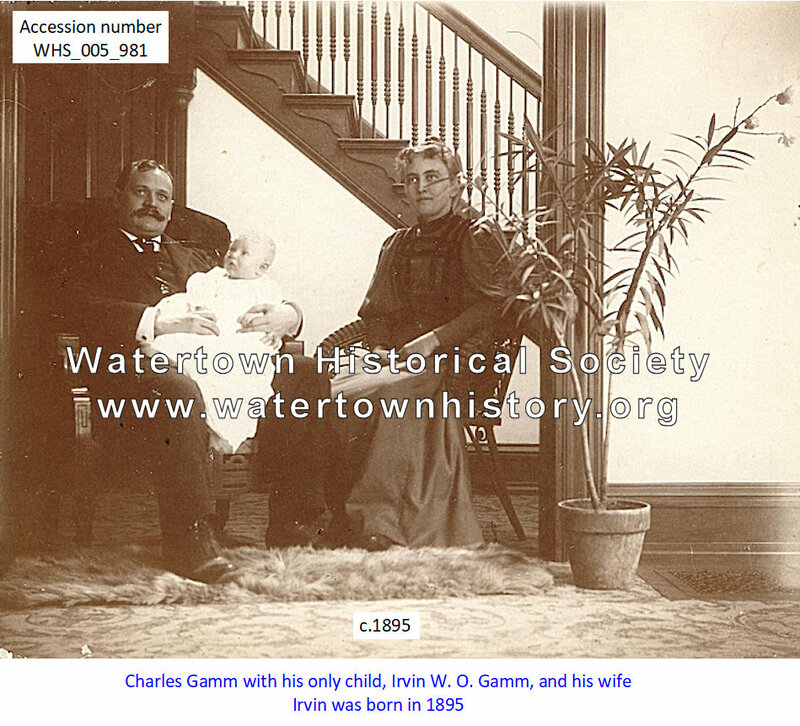 He served his apprenticeship in the Gamm drugstore and after working in several other cities returned to Watertown and purchased the Gamm building where he operated a widely known drug business for many years.